Prime Minister John Key has announced plans to sell-off state assets and cut back Government spending. Mr Key is delivering his state-of-the nation address at Henderson's Trust Stadium to a group of about 380 people, mostly from the business community. ..it's amazing watching the bias of the mainstream media. Phil Goff announces the most radical tax shift to benefit the poor this country has ever seen with the first $5000 tax free yesterday, and the Herald banner adverts on the street are about a Lion and Crocodile fighting each other, and instead of focus on the issues most pressing to a NZ public suffering from the largest recession since 1929, the Herald decides to focus on whether or not Phil dyes his hair. We've played this privatization game before and it doesn't work, selling the Nation's silver wear off to rich corporates while borrowing $120 million per week to fund tax cuts isn't seen as a massive abuse of the collective good, it's perceived as 'progress'. This is all National have, the same failed free market dogma that got the global economy into trouble in the first place. Tx cuts for the rich, deregulation so the mechanisms of managed capitalism are ignored and privatizing assets. These are failed policies that seek only to empower corporations at the cost of democracy, these assets were bought collectively by us, the people, they are not there for Key to flog off! It is telling that it was mainly the business community who were invited to Key's State of the Nation Address, the National Party have the corporate interests of the bankers and farmers at their heart, they are anti-environmental, anti-benneficary and anti-worker, as the smile and wave slips to reveal those interests NZers who favour an egalitarian society should start getting involved to stop this agenda. Ahhh election year. Bring it! The opposition towards asset sales seems to be predominantly ideological as opposed to practical. Allowing a partial share float seems sensible, NZ control is still maintained - and there are other SOE's - Quotable Value and VTNZ for instance where it seems to me to be extremely sensible to sell. Its hardly the family silverwear. However Goff's speech was interesting. A mistake we politicos often make is we dont listen to how 'joe public' see's it. I like to listen to what my wife says - she doesnt follow politics closely, she is a mother, I would imagine that her views are fairly mainstream. She thinks Goff's idea is a good one - and I suspect many people will. It is an immediate tax cut to everyone - helps the poor she pointed out. So are you going to vote Labour I asked her? Nope, its the same faces from the Clark government. 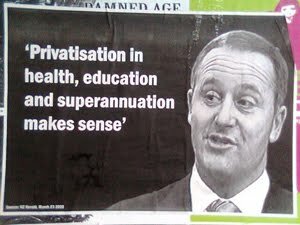 And I suspect thats how New Zealanders will see this - like the idea, not the messanger. Who was invited to Phil Goff's speech? How much are we borrowing a week - the difference between $120 million and $300 million is quite a bit? And why do some commentators state one figure, and other commentators the other? What's the difference between Key borrowing for his tax cuts, and Goff borrowing for his? Perhaps most importantly, where can I get some of that hair dye? It is so magnificent it made me dream of Goff last night! borrowing to a deficit equal to 85% of GDP, in the same boat as Greece, Ireland, Portugal, and Spain, and all in two years and then has the gall to say it doesnt look good! Creating the need to sell the silver ware to the same rich mates you gave a handout to is cynical arrogance, mismanagement, or utter stupidity. or all of the above. To be fair if you are arguing assets are bought collectively by the people, through the actions of a democratically elected government, then a democratically elected government can sell them too. If you think governments are collective expressions of the public they can do things both ways, so that doesn't stack up as an argument in a democracy. Nobody has realistically argued that Contact Energy, Petrocorp, NZ Steel, RNZ commercial stations or the Shipping Corporation be bought back. None of the proposed partial sales are monopolies, indeed I am sure many environmentalists would prefer the state wasn't keeping a very poorly performing coal mining company.